With its Montparnasse address and splendid Art Deco interior, La Coupole delivers a quintessential Paris moment. The 14th arrondissment may not be the French capital’s most beautiful (not by a long shot), and La Coupole is not be the haven for artists it once was, but it still is one of Paris’s best brasseries. It makes an especially fine lunch stop when looking for simple, fresh fare and good wines. Founded in 1927 by Ernest Fraux and René Lafon, the restaurant’s imitation marble pillars and cubist-inspired mosaics are listed in the French Registry of Historic Monuments. In my opinion, the very classic and well-rendered French brasserie-type food deserves to be listed in a national registry too. 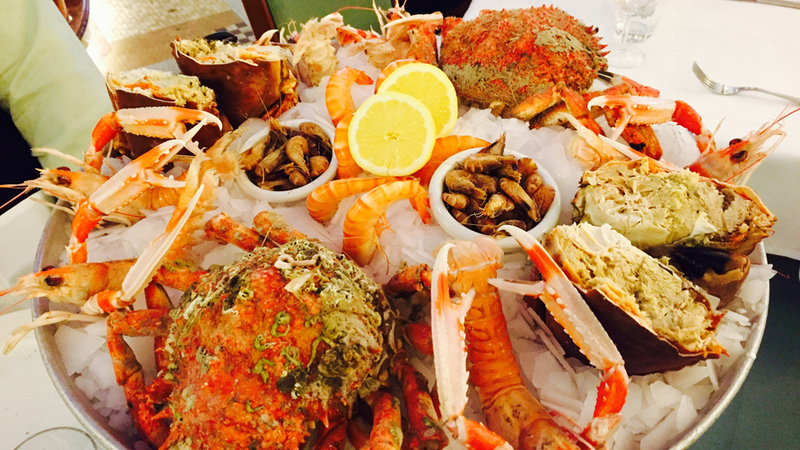 There’s no better way to begin a meal in a brasserie than with a plateau de fruits de mer, an assembly of crustaceans and shellfish usually served cold and on ice. La Coupole offers an array of different such choices. Our group opted for Le Royale Coupole, a bounty of sea water critters some of which I had never even seen before. It makes for fun if slightly messy eating, but the seafood is so fresh you don’t want it to finish. The choucroute de la mer is excellent too, with well-cooked and highly diverse fish species generously laded onto your plate. And while the andouilette was fine, the Crêpes Suzettes turned out to be memorable, and worth coming back for again. Where this famous dish got its name is unclear. The most likely scenario is that the dessert was named in honor of French actress Suzanne Reichenberg whose stage name was Suzette. She lived from 1853 to 1924, and in 1897, while playing in the Comédie Française in the role of a maid, she served crêpes on stage. 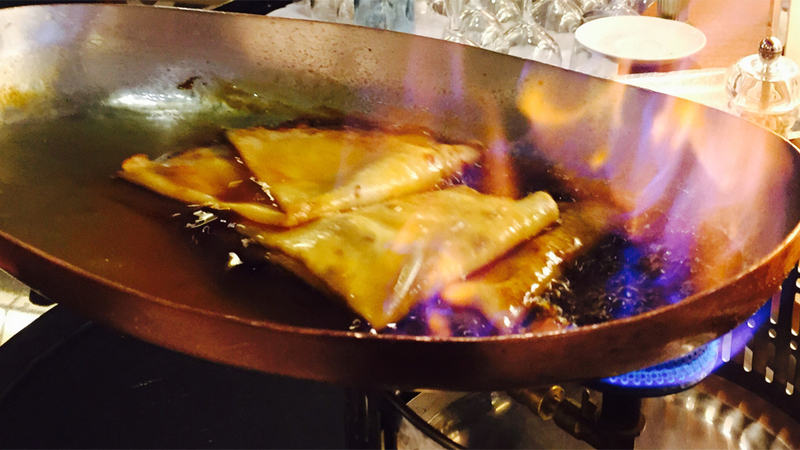 Reportedly, a Monsieur Joseph, owner of Restaurant Marivaux, had made the crêpes and decided to flambé them to better focus the audience's attention. Another, less likely, hypothesis is that in 1895 at the Café de Paris in Monte Carlo, the spirits in a dish being prepared by a young inexperienced waiter, Henri Charpentier, accidentally caught fire; but as the dessert tasted good he decided to serve it anyways (to the Prince of Wales, no less, who was dining in the company of an actress named Suzette; and hence Charpentier supposedly changed the dish’s name, at the Prince’s gentlemanly urging, from Crêpes Princesse to Crêpes Suzette). The story seems unlikely because Charpentier was only fourteen at the time and it’s hard to believe anyone would have let him serve such a high ranking figure, but who knows. And to confuse matters further, Charpentier himself gave a different account of how the original recipe came to be later in life. So I’m not sure we’ll ever know how the name of Crêpes Suzette was born. Perhaps another reason why I enjoyed my lunch so much at La Coupole this time around was the truly delicious wines I had with my meal. How many times has it happened that you think you’ve made what should be a wonderful choice off a wine list and then the wine fails to deliver? I’m quite sure we’ve all been disappointed like that from time to time, but happily this was not the case on this night. Simply put, the 2013 Château Carbonnieux Blanc is a lovely way to start off any meal. Fresh and easygoing, it is literally brimming with early appeal, offering focused white peach, sage and gooseberry aromas and flavors galore. Its lively but harmonious acidity makes it a perfect start to the meal. The 2013 Domaine de Beaurenard Châteauneuf-du-Pape Blanc Cuvée Boisrenard was just as good, if clearly completely different in style and profile. One of my favorite sources of fine southern Rhône wines, Domaine de Beaurenard goes a long way back (founded in 1695, it has been in the same hands for seven generations and counting) but the Coulon family started making their wine at the estate only in 1929. This special cuvée of Châteauneuf-du-Pape Blanc is made from 60-100 year old vines, and is a blend of mainly Clairette, Bourboulenc and Roussanne, with other local grapes such as Grenache Blanc, Picpoul and Picardan also in the mix. It offers sappy orchard fruit aromas and flavors complicated by hints of honey, fresh citrus and tarragon. It’s a supple but lively wine that marries well with our starters. 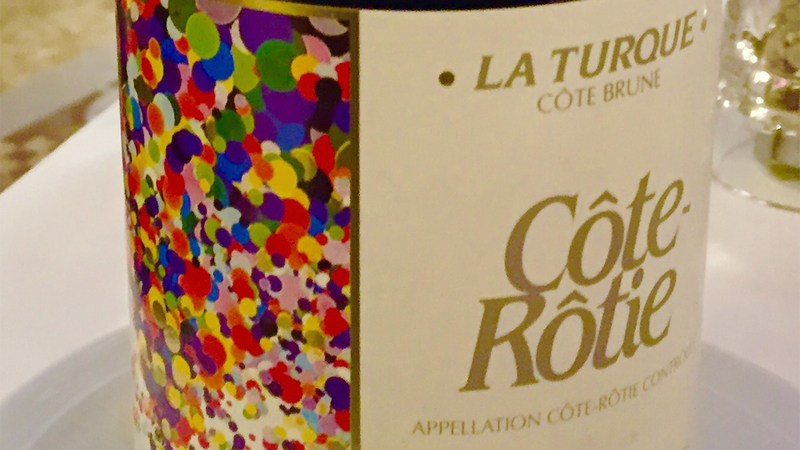 Clearly, with the andouilette we opted for a red, and the marvelous 2008 Guigal Côte-Rôtie La Turque, was featured at a special low price that made it an easy choice. Remarkably suave and silky, with penetrating violet and flinty blackberry and dark plum aromas and flavors, the 2008 is terrific. Very refined, it strikes me as one of the more subtle, almost dainty La Turque that speaks less of its Côte Brune origins. Nevertheless, the memory of this magical wine still lingers with me to this day. It was so good I might say it lit up a few more lights (for us) in the Ville Lumière, and proves a perfect close to a wonderful meal spent in the company of great food, wine and old friends.